Cath and Wren are identical twins and until recently they did absolutely everything together. Now they're off to university and Wren's decided she doesn't want to be one half of a pair any more - she wants to dance, meet boys, go to parties and let loose. It's not so easy for Cath. She would rather bury herself in the fanfiction she writes where there's romance far more intense than anything she's experienced in real life. Fangirl has everything. Love, disaster, family problems, heartache and heartbreak and even a series of books about magic, a series of books inside a novel. This book completely caught me by surprise, not just because of how much I loved it, but because of how intricate, in depth and relatable it was. I fell in love with Cath, the main character, during the first two pages of the book. She had me at the line where she describes her anxiety as ‘black static behind her eyes and an extra heart in her throat’. This resonated quite strongly with me and I was instantly intrigued by the first of many incredible similes that Rowell uses throughout this novel. And the more I read about Cath, and the more inside her head I got, the more I loved her. Yes, one of the reasons I find Cath so relatable is the fact that I’m a 19 year old girl, just finished her first year of university who loves books and fanfiction. But I don’t feel as though this character is only relatable to people in her situation. The author creates such insight into her head, that I feel, even readers who are different than Cath in every possible way, would find her relatable and understandable. It also really interested me that I felt this way about a book that was written in third person narration. I am a huge fan of all books written in first person, as most, if not all, of my favourite books are written this way. I need to find myself able to feel as though I am the character, to understand them that thoroughly that I can anticipate how they will feel about and react to situations before they happen. In a way to almost be transformed into the character as I read the book. It surprised and impressed me greatly that I got this feeling whilst reading Fangirl. I really think that one thing that makes Cath so relatable and understandable is Simon Snow, a book series created by Rainbow Rowell within this book that Cath is obsessed with and writes fanfiction for. It is emphasised throughout the book that Cath uses Simon and Baz as a way to escape what’s going on in her own life. At he end of the each chapter of Fangirl, you will find an excerpt from either the Simon Snow books or Cath’s fanfiction. These excerpts parallel so strongly the events of Cath’s life. For example, at the end of the chapter when Cath meets her college roommate, Reagan, the Simon Snow page describes when Simon meets his roommate at Watford, Baz. 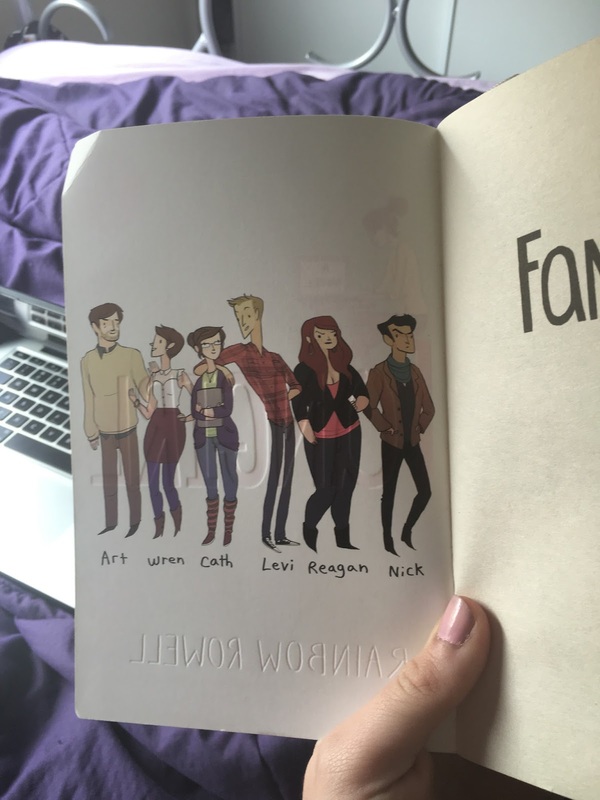 These can also emphasise what is on Cath’s mind, as she gets closer to the love interest, Levi, the majority of Simon Snow parts are about the love between Simon and Baz (in Cath’s fanfiction). Like most young adult novels, Fangirl dealt with mainstream themes like independence, love, mental illness and family problems. But two things that set this novel apart for me was the use of a really independent, strong female character in Cath and the constant use of humour throughout the book. The way that Cath found it possible to find humour in most situations and to make fun of herself a lot of the time really added a more lighthearted and entertaining vibe to the story, as well as making the main character incredibly likeable. And also, just because I feel like it should get special mention. I’m not sure if it’s in all of the copies because mine says that there’s bonus content, but the cute little cartoons of all of the characters at the start of the book made me so happy. It also made it way easier for me, who finds it quite difficult to imagine people, to have an image of each character in my head. I would definitely recommend this novel to anyone that is a fan of John Green and/or David Levithan as the lighthearted, comedic and intricate story and character development is quite similar to books of theirs, with some similar themes as well. 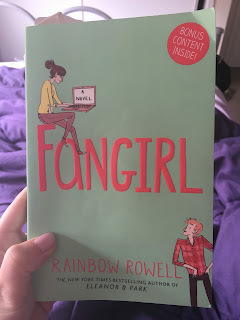 I give Fangirl by Rainbow Rowell, 3.5 out of 5 stars. I haven't read Fangirl yet but I do know a lot about it and I own it, so it's just a matter of time until I get around to reading it. I like that you made the comparison and I am looking forward to seeing if I like the character development as well! You absolutely have to read it! and also, let me know what you think when you do, no one else i have talked to or know has read it and im dying to talk to someone about it! I've heard about Fangirl but haven't gotten around to actually checking it out. I loved your review! I can honestly say that you've made me want to give it a try. Aw thank you so much :) that seriously means a lot to me!